This blog post was written by our Cellarman, Kyle Larson. By trade, Kyle is a microbiologist, and is in charge of all vials & beakers at Fernson. Be prepared for heavy amounts of science in this post. Specs on WBA Forty-Winks can be found here. 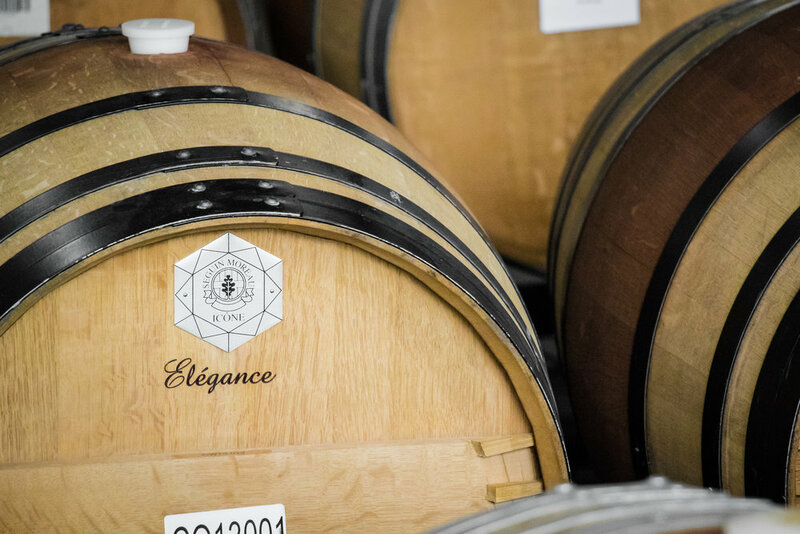 Barrel-aging is a component of a larger process the winemaking industry calls élevage. This refining of green, post-ferment wine into a final product is a challenging undertaking. Barrel selection, aging times, and blend construction are decided by the expert palates of vintners and blenders. These industry veterans aim to use tannin effectively as a structural element in the wine, a stage that provides foundation for other flavor nuances. If improperly blended, the wine tastes flabby and clumsy. Early in the aging of these barrels of Forty Winks, our house Russian Imperial Stout, we saw the tannin begin to take over. I remember being disappointed as I’d taste through the barrels; the tannin was so overpowering it monopolized the palate. Unbeknownst to me, there were growing notes of vanilla, burnt sugar, and pecan hidden under that astringency, flavors that would re-emerge as the tannic structure matured. This maturation process is hard to explain; tannin chemistry really is a funny thing. You almost have to study it just to understand why you don’t understand it. Tannin is a larger polymer made up of smaller flavanol building blocks. Basically, there’s two main players here: hydrolyzable and non-hydrolyzable tannin. The hydrolyzable tannins are mostly left behind by the wine the barrel used to hold. These compounds are extracted from the skins and seeds of the grapes and are softened with age. Non-hydrolyzable tannins are from the oak barrel itself. Oak tannin is a smaller proportion of the total tannic structure and the less astringent of the two. While chemically similar, at first glance these two polymers are starkly different. Hydrolyzable tannin comes together like LEGO blocks. These individual pieces, various flavanol monomers, stick together to make a relatively well organized tower. There’s a carbon-carbon bond between the dihydropyran ring of one monomer and the benzene ring of another that can be plugged together or seperated without changing the individual block. On the other hand, non-hydrolyzable tannin looks more like a tangled pair of headphones. Non-hydrolyzable tannin is doubled over on itself and bonded internally. These knotted up bonds are protected by the outer part of the polymer and are much more resistant to hydrolytic change. Inside the barrel, hydrolyzable tannin is in a constant flux of coming together and breaking apart. While the individual molecules change frequently, the 10,000 foot view shows a general trend towards softening of the tannin profile. Tannin polymers can grow big enough to fall out of solution and will settle at the bottom with yeast cells and other macromolecules in solution. We know what the tannin profile of wine does as it ages, but molecularly, we see something happening that should have the opposite effect on the flavor. You can imagine why this is such a tough thing to study. Our methods of analysis tend to miss the forest for the trees. There’s no way to follow the life cycle of every flavanol monomer in a barrel from fresh to finished product. We traded man for machine in our effort to derive the most basic principles of élevage, and the labs of analytical equipment we’ve thrown at it have sent us right back to the start. The most valuable data we’ve gotten is that the expert palates of vintners and veteran blenders still reign supreme. How disappointing. I’m decidedly not an expert vintner or veteran blender. As Fernson’s resident lab rat, I’d rather rely on spectrophotometry to understand the evolution of a barrel-aged beer. In my time in the cellar at Fernson, I’ve learned to extrapolate what kind of Lion’s Paw a warm, sulfury sample from a fermenter will become. I can pretty well map how many days a batch of Shy Giant is away from being ready to dry hop. But outside of the geuze brewers of Belgium, the beer industry doesn’t work with tannin the way the wine industry does. Month after month, we tasted through the racks, and I found myself sidetracked by flavors reminiscent of over-brewed black tea. I hadn’t learned to speak the language of tannin quite yet. All the way to package, I dreaded doing our sensory panels with this beer. When, after 13 months, we finally made the decision to rack and blend the barrels, I had long since given up on having a wine barrel RIS I’d be proud of. We bottled, conditioned, and labeled around 700 bottles, and when it came time to do pre-release sensory, I had low expectations. Instead of the messy and gripping tannin I expected, the heavy-handed astringency mellowed to meet the complex flavor development that was hiding underneath it. If you drink this batch of Wine Barrel-Aged Forty Winks and appreciate the creamy milk chocolate top notes, the subdued dried cherry, the complex nuttiness in the malt body, and the stabbing tannic finish, thank Blake and Derek for seeing this gem while it was still in the rough. Wine Barrel-Aged Forty Winks was made with their patience, their expert palate, and their tendency to ignore the grouchy cellarman who insisted their wine barrel-aged RIS was hopeless.